Orleans County vital records can be obtained from the Newport City town clerk. The town clerk's office is open weekdays 8 am to 4:30 pm, and the clerk/treasurer may be reached by telephone (802-334-2112 or 802-334-3892), fax (802-334-5632), email (kjim@comcast.net), or mail. Certified copies of birth, death and marriage certificates cost $10, while uncertified (informational only) copies are $2. 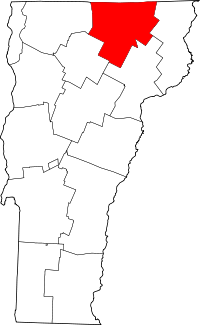 The other town clerks in Orleans County are located in the towns of Albany, Barton, Brownington, Charleston, Coventry, Craftsbuly, Derby, Glover, Greensboro. Holland, Irasburg, Jay, Lowell, Morgan, Newport, Troy, Westfield, and Westmore. Records dating back to 1760 are available at the Vermont State Archives in Montpelier.